Scientists solve a problem that troubled Charles Darwin – the diversity in the size and scaling of worker ants. Rudimentary “organs” are tissues that appear only transiently during the embryonic stage of an organism’s development– and which are remnants of a more developed feature found in a distant ancestor. Scientists at McGill have found the answer to a question that perplexed Charles Darwin. So much so, that it actually led him to doubt his own theory of evolution. He wondered, if natural selection works at the level of the individual, fighting for survival and reproduction, how can a single colony produce worker ants that are so dramatically different in size – from the “minor” workers with their small heads and bodies, to the large-headed soldiers with their huge mandibles – especially if, as in the genus Pheidole, they are sterile? The answer, according to a paper published today in Nature, is that the colony itself generates soldiers and regulates the balance between soldiers and “minor” workers thanks to a seemingly unimportant rudimentary “organ” which appears only briefly during the final stages of larval development. And only in some of the ants – the ones that will become soldiers. Charles Darwin, On the Origin of Species by Means of Natural Selection, J. Murray, 1859 - On the ‘one special difficulty’ with his theory of evolution. “It was a completely unexpected finding. People had noticed that during the development of soldiers that a seemingly useless rudimentary “organ” would pop up and then disappear. But they assumed that it was just a secondary effect of the hormones and nutrition that were responsible for turning the larvae into soldiers,” says Ehab Abouheif from McGill’s Biology Department, the senior author on the paper. Abouheif has been studying wings in ants for the past twenty-three years. He was curious about the function of the wing imaginal disc which appears, transiently, in the final stages of larval development among the soldier ants. Even though the soldier ants never actually develop wings. So he and his team, spent nine years in the lab, using various techniques (surgical and molecular) to cut away portions of the rudimentary wing discs from the larvae of soldier ants in the widespread and very diverse Pheidole genus. They discovered that by doing so, they affected the growth of the head and the body. Indeed, they found that they were able to scale the size of soldier ants by cutting away differing degrees of the imaginal wing discs, with a corresponding decrease in the size of the heads and bodies of the soldier ants. It was clear confirmation that the rudimentary wing discs play a crucial role in the development of soldier ants. The researchers also discovered that the colony as a whole maintains the balance between soldiers and minor workers by regulating the growth of the rudimentary wing discs in larvae. 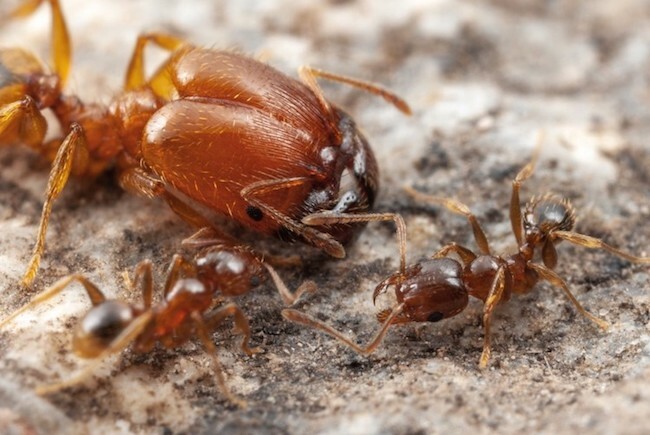 Earlier research had shown that the ratio of “minor” workers to soldiers remains constant in all colonies of the Pheidole genus, with a proportion of “minor” workers at 90-95 % to 5-10% soldiers. The McGill team has found that the soldier ants maintain this ratio by halting the growth of the rudimentary wing disc with an inhibitory pheromone when there are too many soldiers. However, the colony is able to ramp up the number of soldier ants very quickly if it is under threat or the numbers of soldiers have dropped for some reason because the rudimentary wing discs that play such a crucial role in regulating the number of soldier ants appear only in the final stages of larval development. A more important role for all rudimentary organs than previously suspected? The research was funded by Konrad Lorenz Institute (KLI) fellowships, Natural Sciences and Research Council of Canada (NSERC), Guggenheim Fellowship.